The summit cairn is indicated as an antiquity on the Discovery map but the summit itself is nameless. The name Carnavaddy is given on the Táin Way map guide. Carrickrawor (An Chreig Ramhar [LL]), Slievetrasna, Slievestucan and the Castle are marked as satellite peaks or slopes of this mountain. 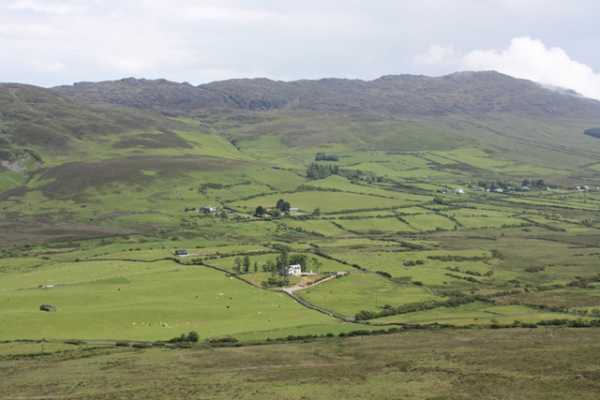 Corrakit (Corr an Chait) is a townland to the east, on the north side of the Windy Gap. [OSI] Carnavaddy is the 643rd highest place in Ireland. Most contributors seem to have approached Carnavddy from the north. I found an alternative easy approach from the south that takes advantage of straightforward tracks, and is accompanied by fine views across to Slieve Foye all the way. I parked at J134 117 C along the minor road that approaches the Windy Gap to the SE of Carnavaddy. There is room for one car where the Tain Way leaves the road and crosses a stile onto the hillside. There are actually two stiles – one older wooden one, and a newer metal one obviously built as a part of the Tain Way. The metal one even has an image on it to show walkers how to climb over it! After having safely and successfully crossed the 3-step stile, I followed the track NW uphill. The views across to Foxes Rock, Ravens Rock and Slieve Foye are magnificent, particularly set against the green farmland below. The track soon ends at a t-junction at J125 123 J. The Tain Way turns left, and leads off to an area marked on the map as The Castles. Judging by the amount of walkers coming and going that way it is a popular route. I turned right and followed the track another 1km or so to a point just past the 415m spot height at J119 137 K. Here the track sort of peters out, but at this point you are below the SE shoulder of Carnavaddy. By following my nose (and compass in the mixed weather) I picked my way up and over the sometimes rough ground to the summit cairn at J112 139 L.
When setting out to return by the same route I met four scramblers who aimed to drive over the steepest sections of rock and turf. Their wheels sprayed up dirt and loosened rock. I had also seen them earlier across the bog near The Castles and I got a feeling they were regular visitors to the area.